Thank's Bruce! Such a nice thread, and I'm sorry I hadn't found it, or been directed to it in this instance, sooner. I missed it too! Thanks for getting this back up! Cool thread and boat and builder and designer. "All kings are not the same." Last edited by wizbang 13; 06-24-2012 at 09:13 AM. 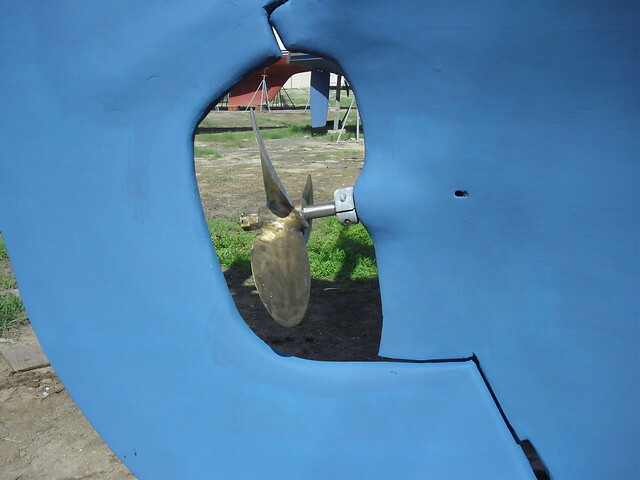 Woodwind's Heiney Dole assisted prop aperture. FG tube permanently set in the sternpost. The little holes go directly in the tube for water cooling the bearing. I have a max-prop, but it is too "un simple" for my taste.The dungeons and pigeons are galv steel, they have been slathered /faired with epoxy from the git go. Very little corrosion. I have always kept the zinc to a minimum, but hardly ever was in a marina. I discked off 25 years of bottom paint about 3 years ago. 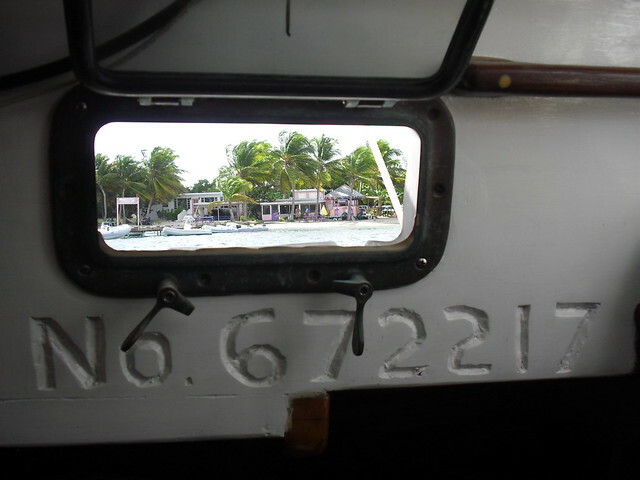 Boatyard in Virgin Gorda, no environmental mentalness. 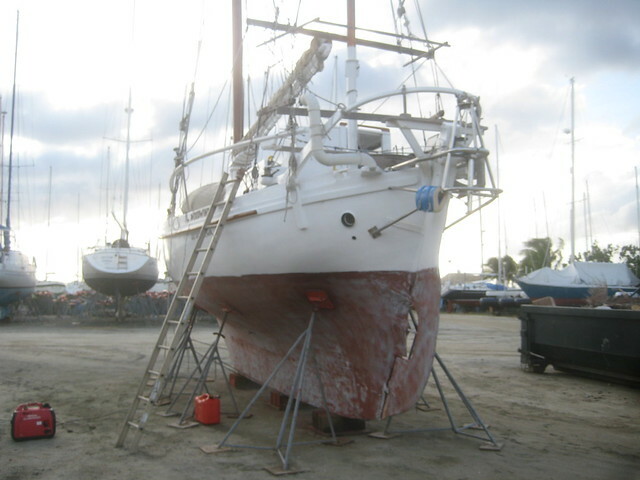 After being stored in the boatyard for 6 months, the old bottom paint looked like a dried mud lakebed. I asked the yard what was theie "policy" regarding dust. They looked at me sideways and said, " dis a boatyard mon". Spun it in 2 days, a dozen 16 grits.She was "painted" with system three, so I did not "wood" her. I rebuilt with various epoxy "coatings" not resin. Last edited by wizbang 13; 06-24-2012 at 09:16 AM. I love the green mizzen... what cloth is that made from? It is 3.8 oz white dacron that I painted with thinned out alkyd enamel. When new, I built the mizzen(s) heavy, from heavy cloth, as the designer recommends. Eventually I came to prefer a light weight one. 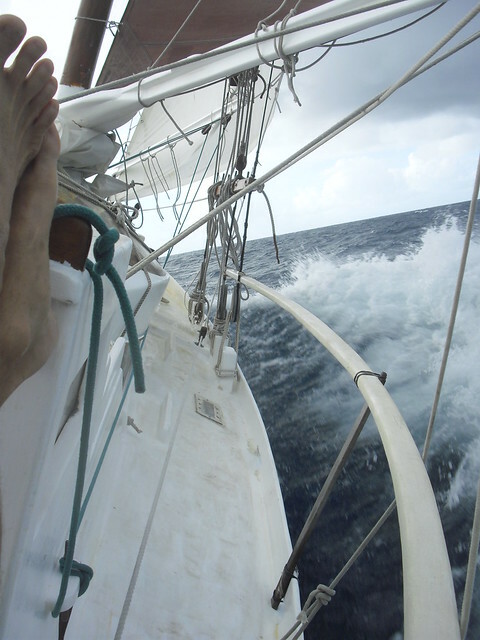 Being anchored most of the time, I usually leave the mizzen up. The light weight burns up quick in the sun, so by painting it , it lasted a bit longer. Yes, It got stiffer. It is gone now, my old main is about to become my new mizzen. This kind of business , rotating sails, re cutting, using cast off sails, was supposed to be a theoretical/romantic advantage of a gaff ketch, and ,to a point it is. The biggest sail, the main, is only 250 sq ft. All the others are easy to make, cut, salvage, cobble. Over the years, decades, I have saved a bundle on sails and gotten better at making them. Last edited by wizbang 13; 06-24-2012 at 09:17 AM. In the Sea of Cortez about 1990. 7 sails.Still had a vivatex mizzen and inner main staysl. Moonlight, I wonder if this could be "Bluemoon" from post 56? Edit,, Hey, wtf happened to half of these photos??? Last edited by wizbang 13; 06-24-2012 at 09:18 AM. 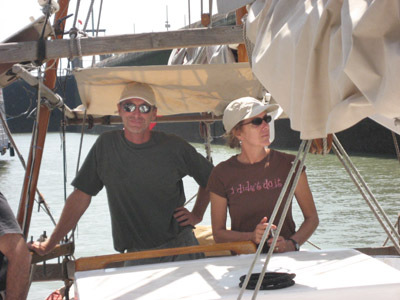 Heading South in2006, just the 2 of us. We had just left San Diego bound for Panama , hopefully non stop, but on the 18th day out, we got hit by Hurricane Sergio, 200 miles west of Cabo san Lucas. We went into port after we got hit for a few days. 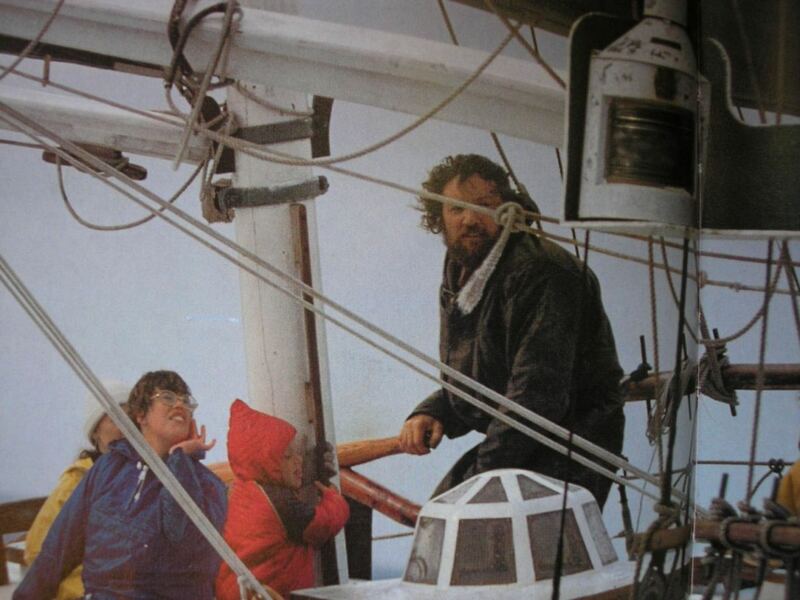 10 days later,back at sea bound for Panama, we recieved a sat nav call from our son at home that Jans Dad had died, so we went into Costa Rica so she could fly home. It was while there alone I turned on a computer for the first time and sent my first e mail. Lotta detail in this pic. 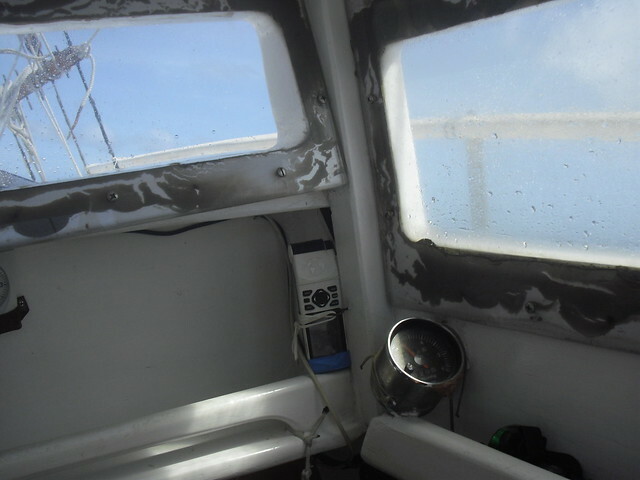 My mini fluro masthead light, homemade radar gimbal, good look at my dingy frapped down. Had a fairly new set of sails then, I made them all cept for the main.Washington State flag!! Last edited by wizbang 13; 11-09-2013 at 06:18 PM. I am interested in your keel . I have have had one boat with a concrete and metal keel and some to do with another. My boat was definitely tender. 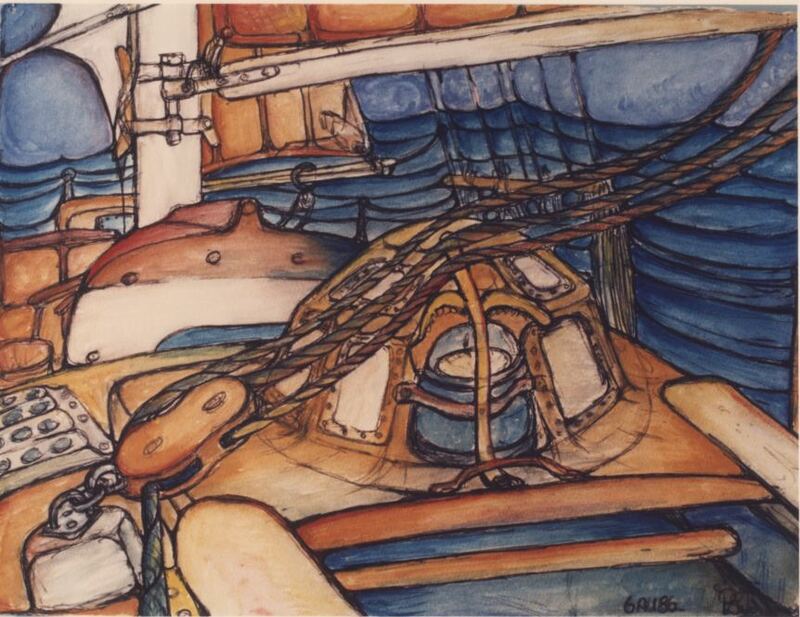 There was little form stability and the lack of effective weight (SG perhaps 2.5 to 3) meant the buoyancy of the keel severely reduced the effectiveness of the weight. The other was a larger Colin Archer type. Again she was a little tender, for the same reasons though less so. How stiff is you boat?? Here she is in a squall. Oh ,Venus 34 is not stiff. She has slack bilges, very deep V. When sitting upright, there is NO flat area. But that is not the fault of the ballast keel. Or the 1000 pound mast. 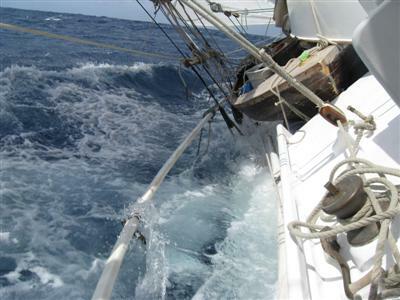 Her natural position , as any monohull, is when the V part is flat in the water, either side. Deep V heels over more. Sitting upright is very UN natural for her. 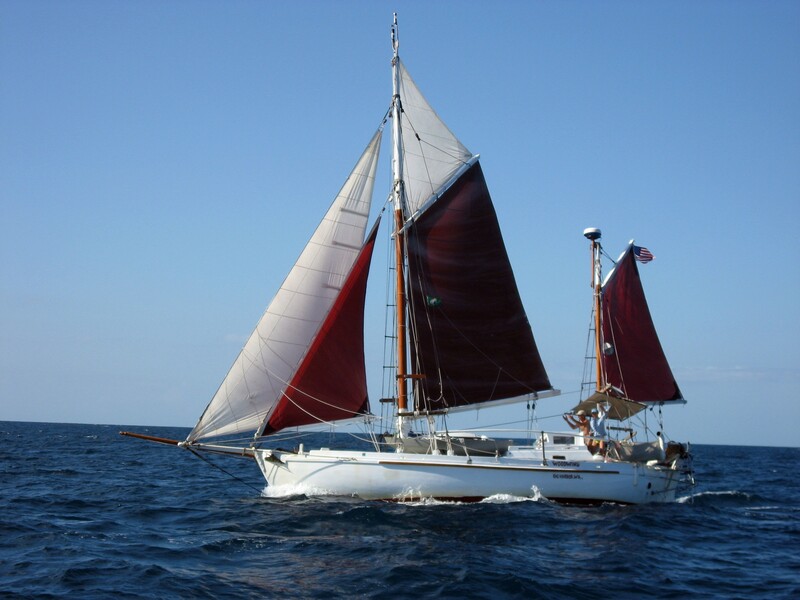 The stiffest boat afloat is a Cape Cod Catboat, and she has NO ballast! Last edited by wizbang 13; 11-21-2011 at 09:39 PM. I know about that. Form stability of the cat is different from the ballast stability of a deeper bodied hull. 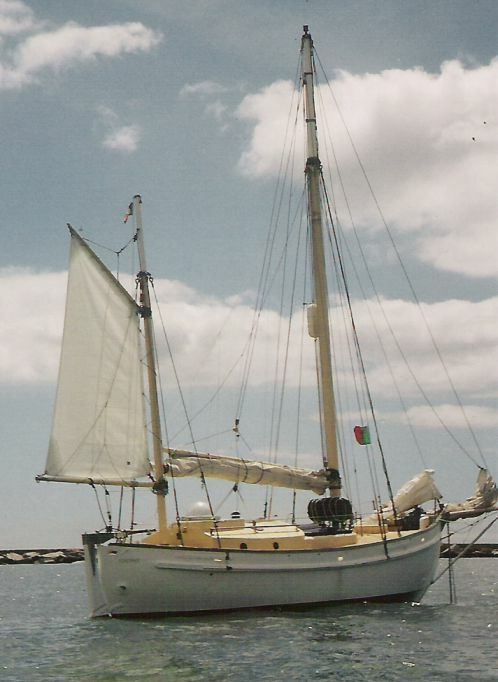 Rozinante and Folk-boat are designed with a high ballast ratio and are stiff and weatherly. Both heel easily and develop the righting lever as they go. Anyway thanks for the reply. The video of the windy reach. That is LIVIN man. 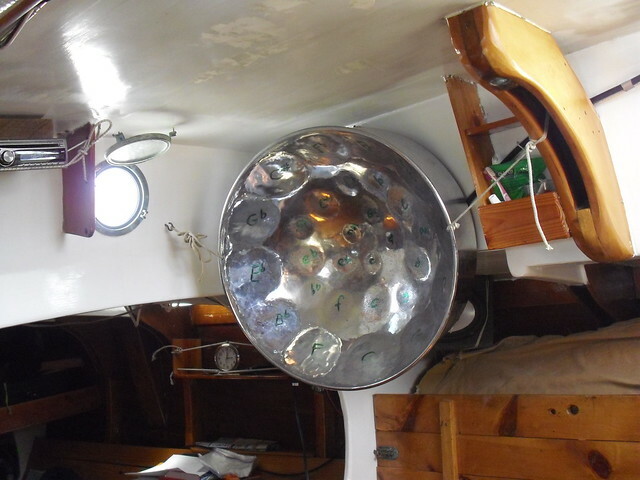 I just fitted my gimballed alcohol stove into the port side galley I just designed on the folkboat, because of a comment I read from you about how it is easier to make a cuppa tea and have right of way at the same time that way. What is "pesky" about the Panama Canal? Glad to help FK, It is something I learned, i didn't invent it! I went through the canal in 88, 95 and 06. , with Woodwind. Each time was more expensive, but that is not a complaint and is to be expected. In 88, I passed through just months before the invasion and tensions were high. All three times we were warned not to be victims of crime. Even inside the supermarkets one can get mugged. Off "campus" it is very dangerous. But then there is the pre choreography of the actual transit. Taxiing to many offices, buttloads of paperwork and time consuming fees. At the last minute, if your line handlers do not show up at 6am, the whole transit can fall apart. It is a FULL day of motoring full speed, 40 miles! In 95 the transition was happening (US to Panama control) , and things were looking a bit funky.Oil dripping down the lock walls ,broken stuff all over. In 06, We saw tension between the people (pilots) at both sides. Hispanic Panamanians in the South and West Indian Panamanians in the North. If you get through without incident, and when the experience is behind you, it is amazing. And, I just like to sail from A to B without stopping. Last edited by wizbang 13; 11-14-2011 at 01:04 PM. I recognized PEJs foul weather viewing dome , in two different photos.If thats what it is? Quite a character by the look of him. Is he still about mate? Makes me sad I offed the dome I was gonna put on my boat. Yes Kiwi, He is up and running. He sailed into Carriacou last winter from the Azores with a 17 YO breasted thing. Bruce, yer a total badass! I would do almost nothing the same way, but I think yer awesome! Remember I was 29 when I built her. If you do NOTwant a boat that takes one third the time, one third the money and one third the maintenance, DO NOT build like this. Stick with a Larrynlin boat for that! Last edited by wizbang 13; 11-21-2011 at 09:42 PM. Yeah, trad. carvel is how I'd go today. Is that what you'd do if you had a time machine? Seems to me that in the long road, nothing is more repairable than carvel. Last edited by James McMullen; 11-16-2011 at 09:15 AM. Long Road? I would have had to do MUCH more maintenance on a 30 year old carvel than a 30 year old strip planked boat. The only thing I would do differently is save up for Alaska Yellow rather than use the Mt St Helens fir for the planking. Maybe a few layers of dynel.Start with a 30hp, might have never changed 3 times. I feel the repairability of carvel is a self fulfilling prophesy. A carvel boat could not be left alone in a boatyard down there.If one tried, there would be repairs.Good luck getting good wood in a hurry . The perceived difficulty of repairing strip plank is a myth. Granted, cold molding over one will add a bunch more steps. Mine is one layer .Inch n a half square. Granted, I have not actually repaired my boat. Edit, in the spring of 2012, I cut out a few black fir areas. Last edited by wizbang 13; 11-09-2013 at 06:20 PM. Man, This thread makes me feel like I've missed something in life. Wizbang, as always, Truly an inspiration, I hope that someday I too can build something to explore "my" world with. 80 gal epoxy, Hamilton marine sells 50 gal drums for $3000. Phewww. Boats iz expensive. Do you have more down below pictures? The Sys Three Resin was about $35 a gal in 84. I bought the 403 in bulk. But the epoxy let me rationalise using Galv. fastenings and the Mt St Helens fir. Both of which would have been suffering by now if I had built carvel. Of course the keel, frames, and the lowest planks were AYC, but the fir to plank the boat was only$600. All the fastenings about$300. The epoxy was almost half the cost. An epoxy boat is a system. It is not like buying some resorcinol and gluing a few pieces here and there. Every piece of wood on the boat is 100% covered with epoxy resin. Woodwind's interior is very basic. A sawzall job. I gutted her after 3 of us lived aboard for 7 years, it was getting funky. There is no fancy joinerwork. And I do not hesitate to modify anythingwhen the mood hits. Last edited by wizbang 13; 11-21-2011 at 09:44 PM. Underway here too.Port side, opposite of pilot bunk. 2 burner primus. 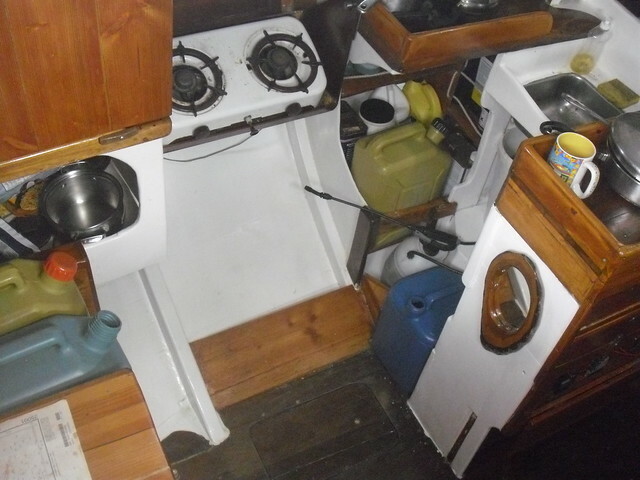 All my water is in 5 gal jugs, no tanks.Sink drains into 5 gal bucket to be emptied by hand.The small "bug sprayer" has sweet water, for showering, it is HOT sailing below in the Caribbean. 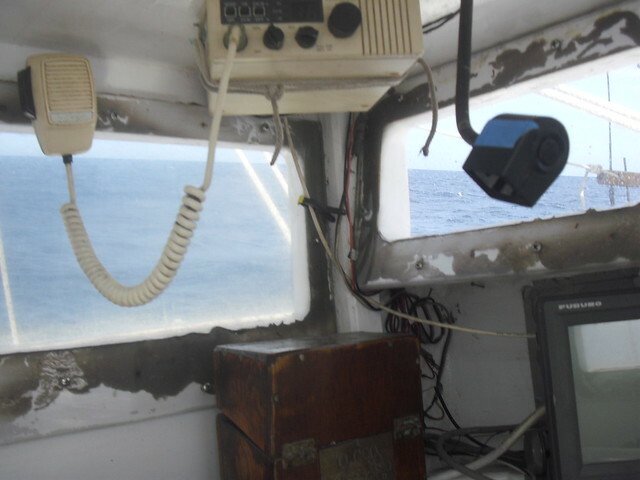 Only a small ventilator(4") .Small wood door on the left is for the galley, it closes.Chart on my engine box. my second "booby hatch"Sliding door , off center.Left and right side of my booby hatch/pilot house. Hey! Somebody's doing 6 knots!!! 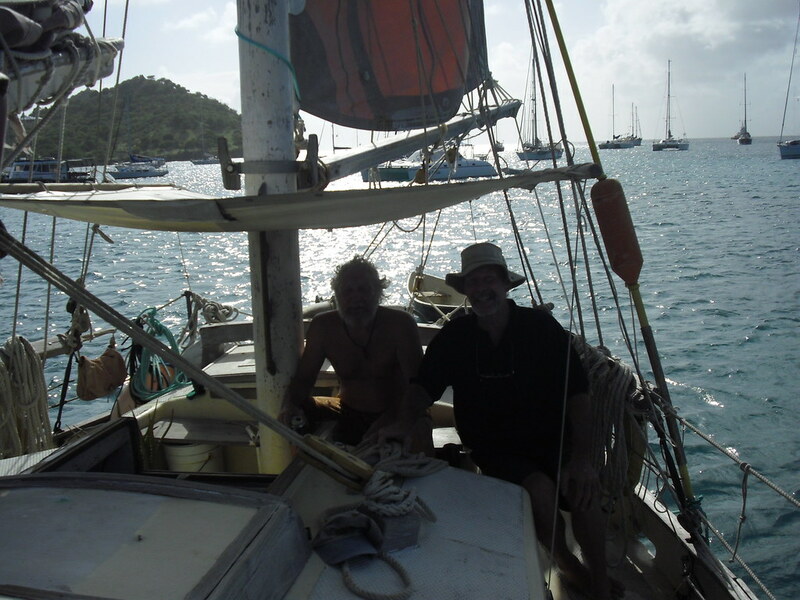 These pics were from last winter, single handed from Carriacou to Antigua, 300 miles. The lexan windows are smooshed in slickseam. Not too pretty but effective. Last edited by wizbang 13; 11-09-2013 at 06:27 PM. What's that in the galley bench upright ,under the coffee mug Wiz? access through to something? Oops. How did that get in there. 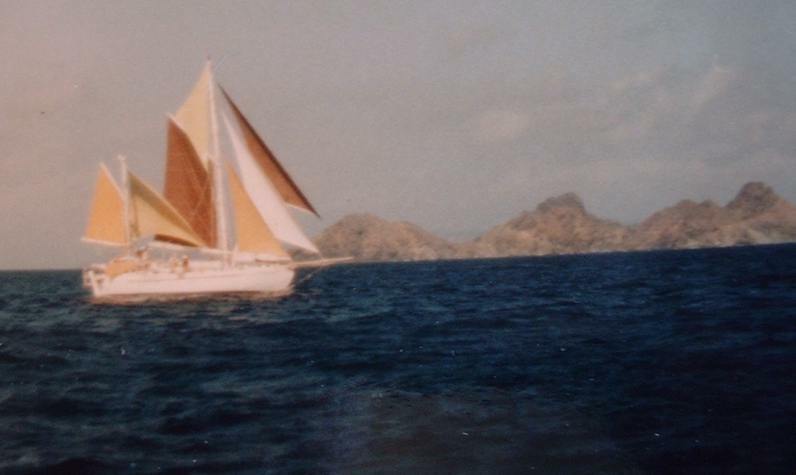 The "Pink Lady" Carriacou Sloop. My wife raced on it in Antigua Classic a few years ago. Somebodys top fell off! Last edited by wizbang 13; 06-24-2012 at 09:27 AM. 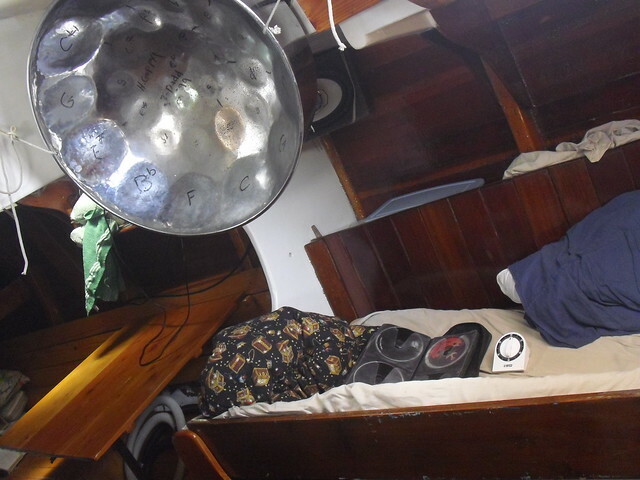 Do you play steel pan? My fav part of carnival. That is a center island sort of. I can wedge inside for cooking on the stbd tack. Under it are 4 small drawers, then my "hoover dam" , (lectricity works)and under that (inside, but on the sole) are my batteries.A sliding ply hatch, visible, access's them. I play THAT pan! "Guppy Brown" low C , 2 n a half octaves! Last edited by wizbang 13; 11-23-2011 at 02:38 PM. Here is a short flickr vid taken the same day . A quick look around.